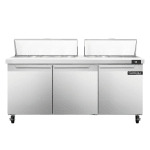 The Continental Refrigeration SW72-18 sandwich prep table has a stainless steel construction that resists corrosion, dents, and scratches. 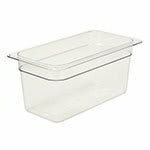 To keep product cold, the unit is insulated by 2 inches of polyurethane foam, and its lids are also insulated to protect the upper layer of food. The top food pan storage space keeps food between 33 and 41 degrees Fahrenheit and holds 18 sixth-size, 4-inch-deep food pans, which come with the unit. 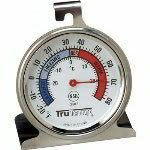 A thermometer is placed inside to monitor the temperature. 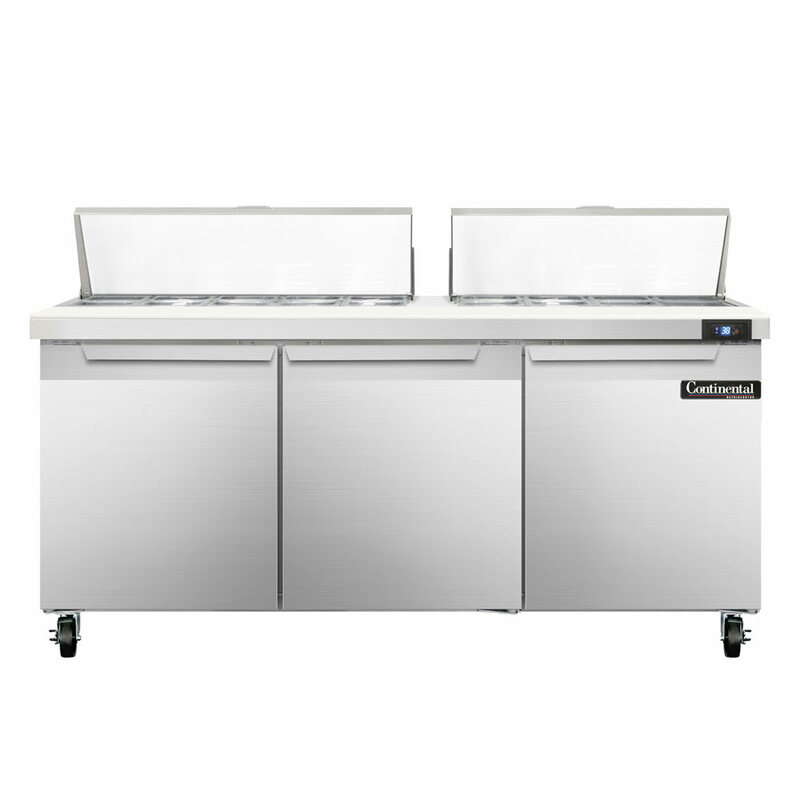 The Continental Refrigeration SW72-18 sandwich prep table has three self-closing doors with gaskets that snap in place to prevent cold air from escaping. 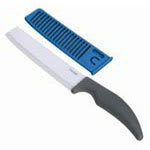 Its three interior steel shelves are coated to resist corrosion, and a 12-inch-deep cutting board provides a place to prepare sandwiches. For movement, four 5-inch casters are included. This unit has a non-electric condensate evaporator that uses heat to evaporate water from the condensation pan. This method eliminates the need to constantly empty the pan. 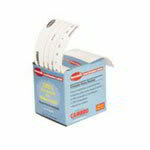 Take a look at our article covering sandwich prep tables to learn more about these tables.